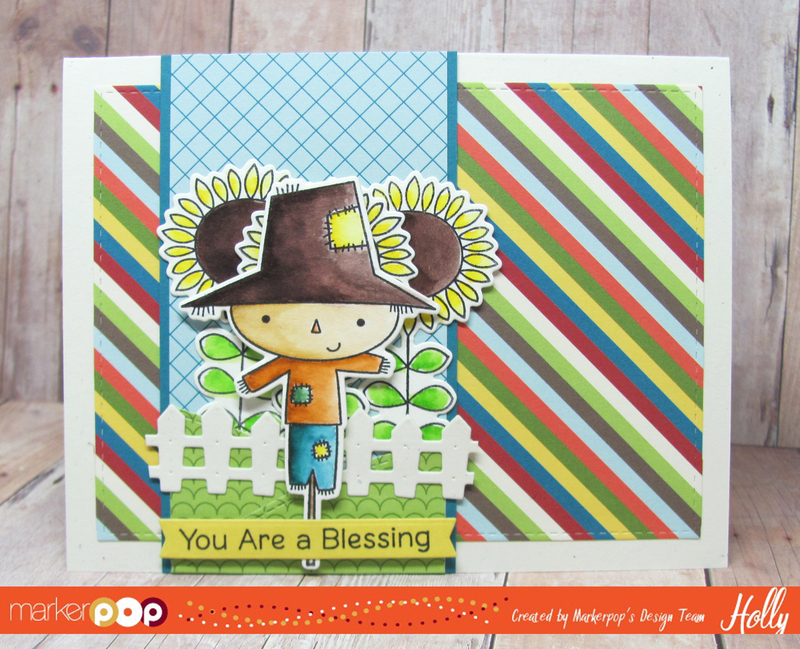 Hollybeary Creations : You're a Blessing! Happy Tuesday everyone.. 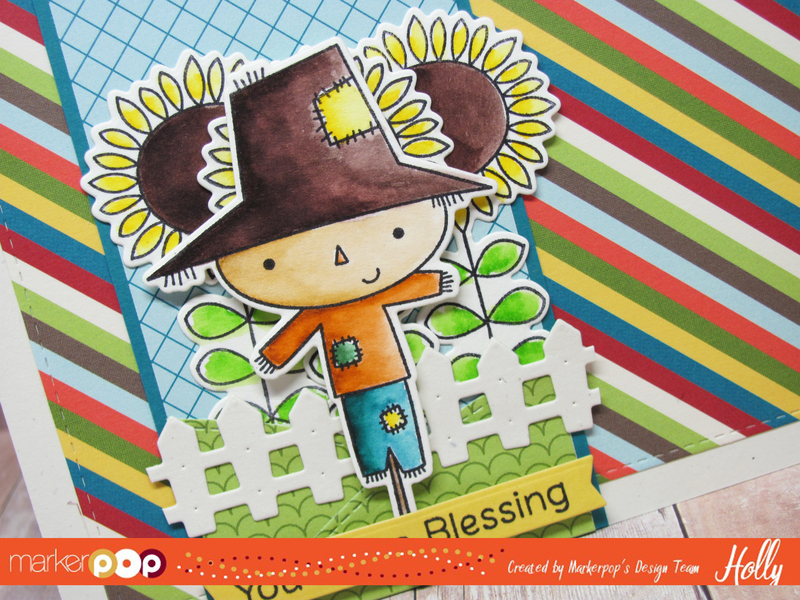 I'm running a little behind, I was over on the MarkerPop blog yesterday with this cute card using some products from My Favorite Things. I started out by creating a standard A2 size card base and then I added a piece of the Trail Mix Patter Paper from MFT that I die cut with the MFT Blueprints #29.Then I trimmed another piece of the same pattern paper from the strip on the front and matted it in a similar color card stock and adhered that to the front. 44 Deep Green, 50 Yellow, 72 Beige, 41 Light Green, 60 Brown & 62 Dark Brown. I colored the images from the Fall Friends set from MFT on one side and then pulled the color out with a damp paintbrush. Once the images were dry I used the coordinating Die Cuts to cut the images out. For a ground area I die cut the Stitched Valley Die from MFT using some more of the same Trail Mix pattern paper and adhered them to the lower part of the blue panel. Then I adhered the sunflower images using an adhesive tape runner. 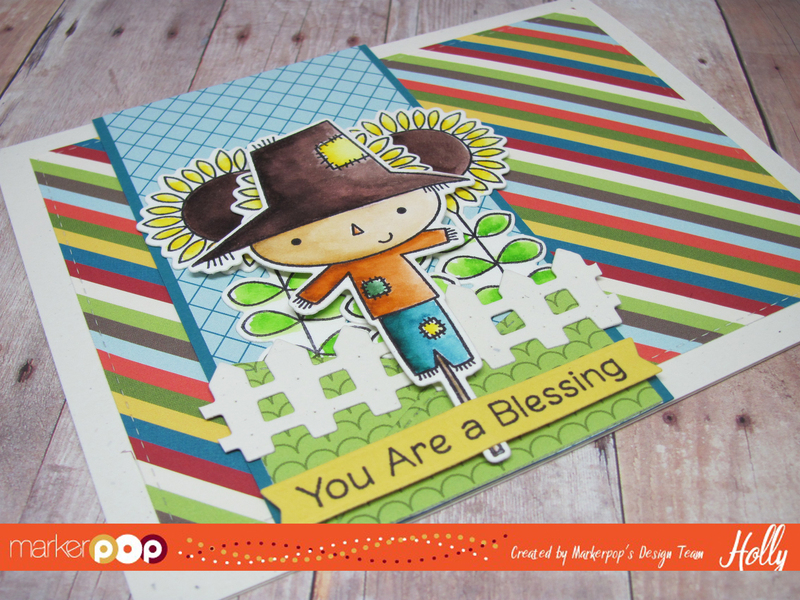 I die cut the Farm Fence from MFT using the same paper I created the card base with. I adhered the scarecrow over the images with some foam tape. 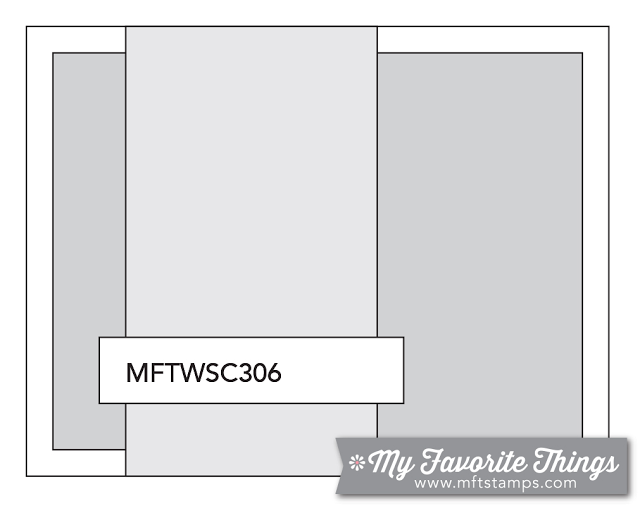 I stamped the sentiment from the Fall Friends set onto a piece of Yellow card stock and I die cut it with the small banner in the MFT Blueprints 27 set. Then I ran it through the big shot again a second time partially die cutting just the end with the banner. This is a great way to customize your banners. I adhered it with some additional Foam Tape. I used the current Sketch over at MFT Challenges.. Head over for great inspiration from MFT!